ThruWall units allow you to accept books, media, and other materials directly inside your building. They are great for use in combination with automated sorting systems or just your standard cart. At Kingsley, we understand if you’re putting something in the wall of your building, you expect it to last as long as the wall. Our ThruWall units are designed and built to last the life of the building and we stand by our quality. Take a look at some of the general ThruWall features below. 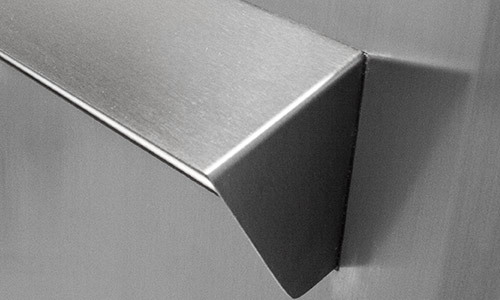 All Kingsley ThruWalls have a stainless steel faceplate treated with a clear anti-graffiti coating. If it’s going to be in your building for years to come, it should look nice. All of our Ease units are entirely self contained, pre-built, and come in one piece. 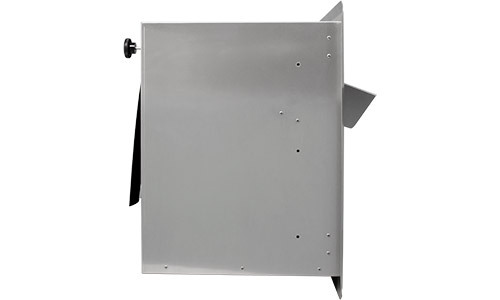 Simply cut a rectangular hole and install, just like a wall or window mounted AC unit. It really is that easy. 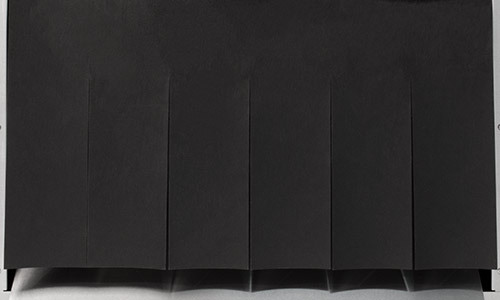 All exterior ThruWalls are designed to keep the depository flap tightly closed when not in use, even in winds. The opening is sealed as much as it can be while still allowing the flap to open which should keep most weather outside of the building. Every ThruWall, with the exception of the Drive-Up, has a way to lock it. 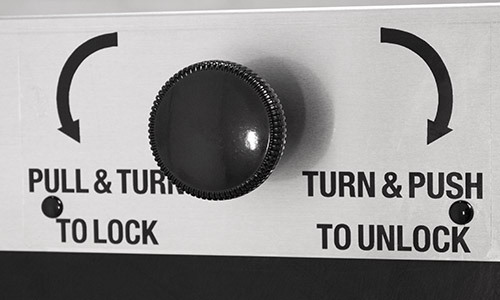 The Ease Single and Ease DualDrop have knobs to lock the depositories, The KwikDrop has a cable system, and the HallPass has thumbscrews to make sure that flap won’t go anywhere. All of these are done from the inside of the building. 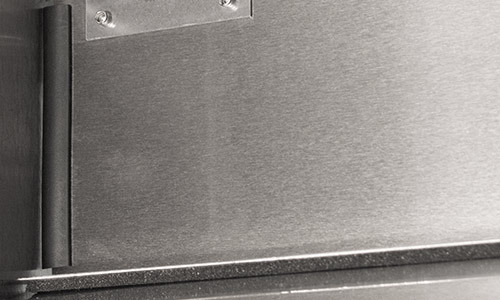 The Payment Drop has a locking cabinet to keep all collected envelopes secure but does not have a lock at the depository. In addition to being able to lock most of the depositories, our ThruWalls are designed with the proper angles to prevent someone from reaching in and taking items. We test all of our units to make sure that nothing sitting in your collection cart will be able to be grabbed and pulled out. In the case of the Payment Drop, the depository is so small, no one would be able to reach inside. All of our exterior use units come with AirBloc neoprene rubber panels which helps to prevent outside air from entering the building when the depository door is opened. Materials slide through but the bulk of the air is contained. It also helps slows the speed of descent for heavy items before they fall into the collection bin. When the depository is not in use, the door holds shut through most wind and other weather. The Payment ThruWall collects envelopes into a locked cabinet that does not allow air though. 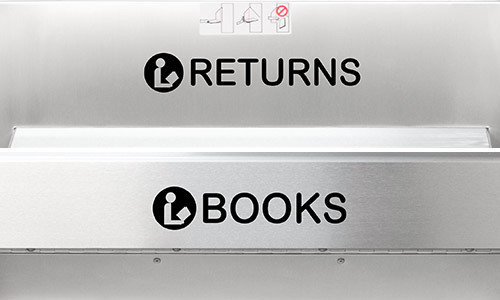 All of our library depository units have the option of “BOOKS,” “MEDIA,” or “RETURNS” with the round universal library logo. We will apply this as a vinyl decal in your choice of color at no extra charge or it can be silkscreened or routed in black for an extra fee. You also have the option of custom vinyl wording on all ThruWalls up to a certain number of characters. Custom silkscreens and custom routing require a custom quotation. All ThruWalls are ADA compliant when properly installed. Each unit allows for easy, one handed deposits without having to pull down a door. Simply push the item all the way through the depository flap. All units are available with high contrast wording that is dependent on your choice of vinyl color, if you choose vinyl. Braille labels are available in “Book Drop,” “Video Drop,” and “Payment Drop” to further help identify the purpose of your ThruWall. Be eco-conscious knowing you’re using recycled materials. Our stainless steel faceplates are made of up to 90% recycled materials and the interior aluminum components are made of up to 85% recycled materials.